The Cleveland Browns were so very, very close to pulling off the upset of the season on Sunday against the New England Patriots. But in the end, Tom Brady and the Patriots got by – with more than a little help from their friends in the striped shirts. When quarterback Jason Campbell hit tight end Jordan Cameron with a four-yard touchdown pass to give the Browns a 26-14 lead with just 2:39 left in the game, it certainly looked as if the Browns were going to come home winners. But then Brady took over, leading an 11-play, 95-yard drive that resulted in a touchdown pass to Julian Edelman. A two-point conversion and suddenly, the Browns lead was down to just four points. There was only a minute left in the game, however, and the Patriots still needed to recover an onside kick and drive for a touchdown – all with no timeouts. Helping the Patriots cause was a bad roughing penalty on Browns safety Jordan Poyer on Edelman’s touchdown catch, giving the Patriots a shorter field to work if – if they recovered the onside kick. The Patriots recovered the kick – because of course they did – thanks to Fozzy Whitaker touching the ball when he tried to block New England kicker Kyle Arrington. Two plays later, Brady went deep to Josh Boyce but the pass was incomplete thanks in part to some nice coverage from Browns corner back Leon McFadden. But the official watching the play somehow decided that a rookie third-round pick couldn’t possibly come up big in such a tough spot and called a phantom pass interference penalty on McFadden. With the ball on the one-yard line, Brady hit Danny Amendola for a touchdown pass and that was the game. We want to say the ending was pretty unbelievable, but this is Cleveland so, it really wasn’t, you know? That ball getting placed at the 1-yard line on that call is an injustice. The last minutes of the game overshadowed what was a solid effort by the Browns for the first time in weeks. Campbell obviously got the message this week that it is a good idea to throw the ball to Josh Gordon and Cameron. The pair combined for 16 of Campbell’s 29 completions and 272 of his 391 passing yards. Cameron finished with nine catches for 121 yards, while Gordon kept being Josh Gordon, finish with seven receptions for 151 yards and an 80-yard touchdown reception where he made the Patriots secondary look foolish. The touchdown reception was Gordon’s third of more than 70 yards in the past four games and he has now had an NFL-record 774 receiving yards over the past four games. He also finished the game with 1,400 receiving yards on the season, easily eclipsing Braylon Edward’s franchise record with three games left on the schedule. The Browns could have put the game away earlier, especially with the defense pitching a shutout in the first half, but the offense punted on four of its six first-half possessions. The only scoring came on two Billy Cundiff field goals. 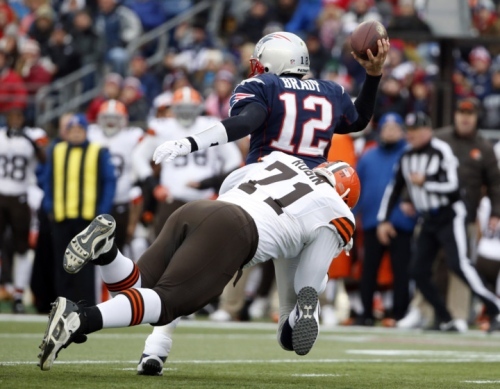 The fact that the Browns held the Patriots scoreless in the first half was made even more impressive by the fact that it was the first time in seven weeks that the Browns did not give up a score with under three minutes remaining in the first half. Campbell deserves credit, too, for the Browns fourth-quarter touchdown drive that almost put the game away. Following a Steven Gostkowski field goal cut the Browns lead to 19-14 with just under six minutes remaining, Browns fans everywhere were waiting for the subsequent three-and-out form the Browns. Instead, Campbell led the team on an eight-play, 90-yard drive that culminated in Cameron’s touchdown reception. But it wasn’t enough, because it never seems to be enough. “Obviously very disappointed in the outcome of the game,” Browns head coach Rob Chudzinski said after the game. “Not disappointed in the effort of our team and how they played today. I’m proud of the way they played. It’s difficult. We can grow from this, however, and learn to play better. Trust us, coach, we all know the feeling. Oh, and can we finally ditch the brown pants now?